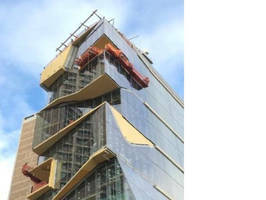 Seattle – Spider, a division of SafeWorks, LLC, provided a complex access solution for the challenging façade installation on Columbia University Medical Center’s (CUMC) new, 14-story art education center in Washington Heights, New York. The unique architectural design of the building consisted of irregularly stacked glass panels supported by delicate glass fins on the south end, and an aluminum curtain wall on the north end. In the early planning stages of its collaborative search for a solution, Josef Gartner USA, a division of Permasteelisa North America Corp., looked to Spider to safely meet all of its rigging and access challenges. The complexity of this project inspired the development of Spider’s System Group, a team of elite suspended access experts with unparalleled experience to manage complete solutions from concept to completion on the most challenging jobsites. Spider’s System Group, led by Spider veteran Clint Ramberg, worked closely with its engineering team, local New York operation center, and the customer to design a complete access solution for CUMC. A custom porch design was implemented on the building’s south end for the installation of the large, delicate glass panels. Then a monorail system with a swingstage, outrigger suspension, and Beta Max Leo XXL VFD 2,000-lb capacity material hoist worked in conjunction to enable the crews to safely maneuver the panels into position while overcoming the multiple, random overhangs posed by the unique structure of the building. Three additional custom monorail systems, ranging in length from 20 to 60 feet, were installed and equipped with Beta Max material hoists for the curtain wall installation on the north end. Because this jobsite is located on the windy west bank of the Hudson River, Spider engineered custom catch baskets for electrical cables, double wire rope winders, and dogline modular platforms that eliminated the need for safety lines. These features simultaneously protected workers and the delicate façade from dangling equipment. Additionally, Spider’s solution included eight SC1500 traction hoists, gantries, max reach assemblies, OBS frames, and a custom trolley for the material hoist controller. Spider conducted on-site safety and service training for the crews. And when faced with limited site access and strict union labor requirements, Spider’s team worked swiftly with long-time customer Doria to provide compliant rigging labor.